NASA's Hubble Space Telescope captures an image of Pluto and its satellite Charon (below Pluto and to its right). Pluto's demotion to "dwarf planet" in 2006 (and its recent designation as plutoid) is still hotly debated. Or more specifically: What exactly is Pluto? And do we really need a term like "plutoid" in our lives? On Thursday, Pluto the planet(oid) was the subject of a sometimes feisty "debate" between astrophysicist Neil deGrasse Tyson, director of the American Museum of Natural History's Hayden Planetarium, and planetary scientist Mark Sykes of the Planetary Science Institute in Tuscon, Ariz. Both scientists agreed that, with our rapidly increasing knowledge and understanding of space objects, we also certainly need an expanded lexicon to describe them. But the debate's central question is one that is also familiar to evolutionary biologists: When it comes to classifying things (whether species or planets), is it better to be lumpers or splitters? In 2006, the International Astronomical Union (IAU) — responsible for naming astronomical bodies since the early 1900s — decided to redefine the term planet. The new definition specified that to be considered a planet, a space body needed to not only be round and orbit the sun in a circular fashion, but also must "clear" that orbit — in other words, have enough mass that it can scatter or remove any lingering space debris from its orbital path. Planetary-like objects that didn't quite satisfy these criteria were considered "dwarf planets." That definition effectively demoted Pluto from planetary status, causing an uproar among some Pluto loyalists in both the astronomical and the nonscientist community (although, as Tyson suggested, some of the outcry might have been motivated by lingering nostalgia for a certain cartoon dog). Then, in June, Pluto and objects like it were given another new name by the IAU: plutoids. Plutoids are celestial bodies that orbit the sun beyond Neptune, are massive enough to be basically round ... and, nope, don't clear their orbits. 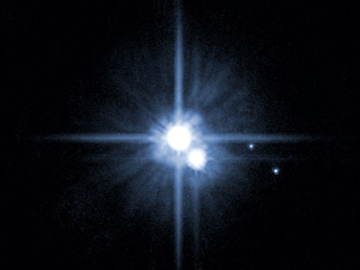 As it stands, there are two known plutoids: Eris (discovered in 2003 and initially considered as a possible tenth planet) and Pluto itself. Although they have prompted some confusion and resistance, such new definitions are necessary, Tyson said. "The word planet has lost all scientific value," he argued. In the "good old days," he added, the word planet "had utility because there wasn't much else to talk about," when it came to these wandering objects. Now, however, the word is just an inaccurate catchall. And that can become a particular problem as astronomers expand their discoveries to extrasolar objects. But other astronomers, like Sykes, take exception to the IAU's definition — not because a new definition isn't necessary, he said, but because the one the IAU came up with is not particularly useful. "How we classify things is part of the scientific process," he said. In other words, he said, astronomers are interested in how objects resemble each other, such as their common physical properties, for the purposes of studying them. The IAU's definition isn't about such physical characteristics — for example, whether the object is a ball of rock or gas — but basically considers the objects merely as "point masses" rotating around a star. Instead, Sykes proposed, astronomers should apply a simpler criterion for what makes a planet a planet: Basically, it should just be round. That's not as simple as it sounds, however — for a celestial object to be round, it has to have enough mass that its own gravity condenses it into a nearly spherical shape; objects of smaller mass (such as asteroids) tend to take odder shapes. Starting with "round" as a definition for a planet, he said, then allows for subcategories, such as objects that are gassy, rocky and/or able to clear their orbital paths. It would also mean that instead of eight planets currently orbiting our sun, the solar system would suddenly balloon up to thirteen. Both sides presented interesting points, but although there is a growing scientific consensus that the IAU's definition contains some serious flaws, the organization stands by its definition of a planet and its classification of Pluto, for the moment. Indeed, it expects more plutoids to be added to the short list as new discoveries are made. But when the organization next meets, in August 2009 in Rio de Janeiro, Pluto's status may again be a source of debate. Transcripts of the debate, which was held at the Johns Hopkins University Applied Physics Laboratory in Laurel, Md., and was moderated by National Public Radio Science Friday host Ira Flatow, will be available online at APL's Web site. Johns Hopkins University Applied Physics Laboratory - "The Great Planet Debate"